← Forgotten Foto Friday: Eudioctria sp. 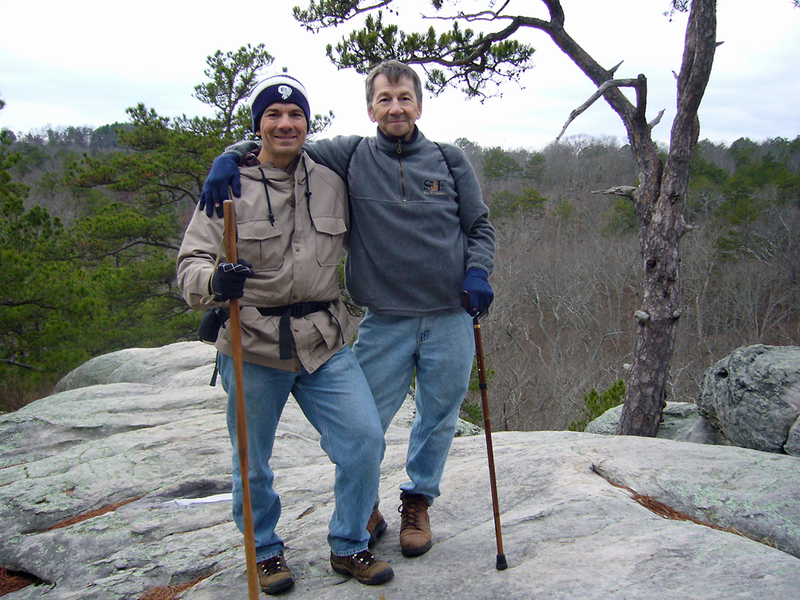 I first wrote this post on Father’s Day 2008. It didn’t appear on Beetles in the Bush, but rather my other blog, the now largely defunct Bikes Bugs and Bones. My dad is my hero, my confidant, and my best friend. It’s hard watching him age, but it would be even harder not to. I repost on this day in his honor and urge everyone to honor their own father is some small way. Happy Father’s Day! My dad had knee replacement surgery a couple days ago. The surgery went off without a hitch, and he’s doing very well. All signs are that he will bounce back quickly and suffer few, if any, complications. I’ve spent much of the past three days here at the hospital—sometimes providing support and encouragement, other times just keeping him company. He should be released tomorrow, and I’ll spend the rest of the week with him at his house—hopefully he’ll be able to get around okay by then. Some thirty years ago, my dad got an infection that settled in his left hip. By the time doctors found it and figured out what was going on, his left hip socket had degenerated badly, and the only medical option after cleaning up the infection was a year in a full body cast that resulted in fusion of the socket with the femoral head. This left him with a left leg two inches shorter than his right, a bad limp, and a lifetime of pain medications. His right leg became his ‘good leg’ and his left became the ‘bad.’ Decades of walking with a cane and favoring his bad leg put a lot of pressure on his good leg, and at age 73 his right leg had had enough. Now, his good leg is his bad leg, and his bad leg is, well, still his bad leg. This will add a wrinkle to his recovery, since he won’t have a healthy leg to carry the load while his good leg recovers. But I will be there to help, if needed, and in a few weeks his good leg should be good as new. My dad is not only my dad, but also my best friend. We have a relationship that is based on mutual love and respect, and I don’t know which of us appreciates more what we have with each other. It wasn’t always this way—my dad and I were estranged for 25 years starting when I was 10 years old. My parents married far too young, and each had their own issues—they were but children themselves. Having first me, then my brother and sister, only delayed but could not prevent the inevitable break up that resulted in my fathers absence. I paid a heavy price by not having a father during those crucial, formative years as I finished growing up, but I seem to have turned out okay regardless. It would take many years before I would be ready for something so bold as reconciliation, but maturity and the support of a loving wife eventually made it possible. There were difficult questions to answer, but through it I realized that my father had paid a heavy price as well. Not the selfish irresponsible man I had been taught about, instead I saw a sensitive, deeply introspective man who had lived a life of hard knocks, suffered the consequences, learned from his mistakes and turned his life around. My dad loves to ride bikes. I do too, but I did not learn the love of cycling from him. My dad is simple yet elegant, with an understated class that people adore. I, too, try to show respect and modesty, but I did not learn these things from my father. We both love classical music (he can live without the metal), listen to NPR, and enjoy humor with more than a touch of irreverence—tastes acquired by each of us before we knew each other. What I have learned from my father during these past 15 years is why I am me—a gift I didn’t know I lacked. I don’t mourn the loss of those 25 years spent without my father, rather I rejoice at the very special relationship that we now have—perhaps possible only because of our separate pasts. My father describes that year in a body cast as the darkest period of his life. I did not know him then, so I could not be there to help him through it. While his recovery from knee replacement will not be near that ordeal, neither will it be easy. But I am here with him, and I know in my heart that whatever difficulties he faces during his recovery, he will look back on this as a small part of the best time of his life. This entry was posted in [No taxon] and tagged family, holiday, introspection, landscapes, Missouri. Bookmark the permalink. Nice blog Ted! You are very fortunate indeed that your Dad is still very much part of your life! This is really wonderful. Thank you so much for sharing. Thanks for sharing. Over the time that I have followed your blog I have come to see you as a man of sincere and upright character, and I am glad your relationship with your father has turned out so well. Great post and great photo—touching and inspiring. Thanks.